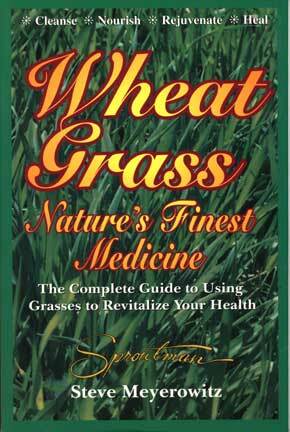 Wheatgrass - Nature's Finest Medecine: The Complete Guide to Using Grass Foods & Juices to Revitalize Your Health. Never underestimate the Power of Nature. The earth is covered with it. Four of the world's top five crops come from it. Muscular 2,000 lb animals sustain themselves on it and science has found every nutrient in it. Could it be that the planet's most ubiquitous vegetation is also its finest medicine? Everything you need to know about this wonder plant and its miracle cures. Including why it works, where to get it and where to go for help. How to grow it, juice it, take it and create a total health restoration program. Includes nutrition, research, healing retreats, detoxification, history, chlorophyll, cancer, real stories by real people. Wheat, barley and Kanut grasses. 207 pages.